1. Arrange these sentences based on the pictures above to make cooking instructions. (1) Put noodles into 2 glasses of briskly boiling water. (2) Your delicious noodles are ready to be served. (3) Put the seasoning, vegetables oil and chilli powder in a bowl. (4) Mix the noodles well with all of the seasoning. (5) Cook the noodles and simmer for 3 minutes. 2. What is the first thing to do when cooking rice using a magic com? b. Washing the rice, in the inner pot. d. Weighing the rice using the measure cup. 3. The maximum amount of rice that can be cooked with the magic com is ... measure cups. 4. “Put it in the inner pot, and adjust the quantity of water." 5. What does the writer write the text for? a. To inform how to serve a salad. 6. How many ingredients are needed to make Tikka Kebab? 7. What does the word “them” in step 2 refer to? • Make sure the switch is off. • Place ingredients into the blender container. Add some water if needed. • Place the container on the motor housing. • Plug in the cable. • Select one of two speed buttons as required. Use PULSE switch for precision blending. When adding ingredients or seasonings, remove the small lid for adding things in the middle of the blender lid. • After grinding, press the switch off. 9. What does the manual tell you? 10. What do we press when we want a very smooth result? 11. How many speed buttons are there? c. To narrate a story. 13. Do you always have to add water? 14. Use PULSE switch for precision blending. The word which is not the synonym of the underlined word, EXCEPT…. 15. What do we do when we want to add something in the blender? b. Open the small closure on the lid. c. Plug in the cable. d. Place the container on the motor housing. 16. When do we plug the cable in? a. Before placing the container on the motor housing. b. Before putting the lid on. c. After placing the container on the motor housing. d. After pressing the switch on. 17. The following are the synonyms of lid, EXCEPT…. 18. Hereka : What do you think of my new tie dye shirt? Retno : …Did you make it on your own? Hereka : Yes, I did. b. Can you show me how to make tie dye shirt? 19. Ratu : Let’s ask everyone in our class to help clean the beach. Ketut : …that they are willing to. Not everyone cares for our nature. Ratu : Yeah, but it’s worth trying. 20. Bonar : Is it possible to make other people aware of the loss that they can cause? Putri : …I don’t think we can make everyone aware of their damaging action. c. I’m very certain about it. d. I’m not so sure about it. Fadhli is going to participate in the story telling competition. Hikmah shows her hope that Fadhli will get a prize. Fitra has just finished drawing a picture of Tinta, his best friend. sure that Tinta will like it. 3. The following are the expression of hope, except …. injured when he rode his bicycle yesterday. What would you say to express your hope about Andi’s condition? 5. Elki : “Happy birthday to you, Mail. May God bless you”. Nisa :”I heard he went to Semarang. His uncle held a wedding party. Haris :”…. I think this movie isn’t fit for us, isn’t for children. Rina :”That’s a good idea, so we can play it in double. D. May I congratulate you on? 10.If we want to ask someone not to tell something, we say…. 12. Fajar says”I would recommend that you pick your brother first then you can go to accompany Heri. I think that is the good solution for you.” It means that he …. 13. Does Indra accept Fajar’s suggestion? 17. Here are the expressions of prohibition, except …. 19. Ani : “Where is Andi, Don? ….. I will borrow some money from him. C. What do you suggest? 20. We …. Have a driving license when we drive/ride a vehicle. To go to the hospital”. B. What do we have to go now? C. You mustn’t go now. D. Do you have to go now? 22. Fajar :”I want to make a kite, but I don’t have paper. What do you suggest? Eko :”… use plastic. I’ve ever seen a plastic kite. 23. Today is our National Examination test. So, we … be late. 24. Throw the rubbish in the …., please. 25. If you want to say a farewell for the last time before I continue my study in Australia, please…. to the Adi Sucipto airport this evening. Fill in the blanks with the correct expressions! Yani : I haven’t told you what happened yet, have I? Indri : I haven’t (26) …. anything. Yani : Yes, I am very excited. Indri : (29) … on your first rank and for you’re a new laptop, Yani. Indri : Sorry, I had to go, Yani. See you in the next semester. 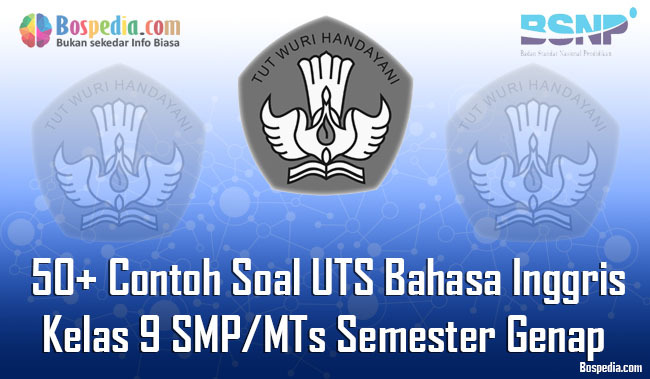 Demikianlah informasi yang bisa kami sampaikan, mudah-mudahan dengan adanya 50+ Contoh Soal UTS Bahasa Inggris Kelas 9 SMP/MTs Semester Genap Terbaru ini para siswa akan lebih semangat lagi dalam belajar demi meraih prestasi yang lebih baik. Selamat belajar! !